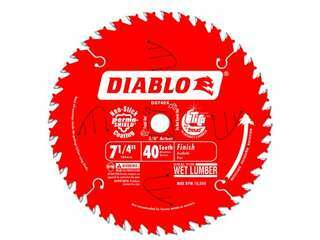 Diablo's thin kerf trim saw blade is ideal for portable and low powered saws on the jobsite. 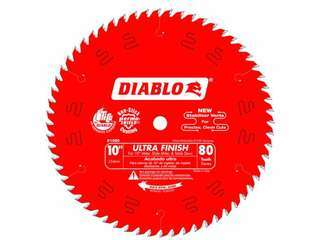 Diablo's trim saw blade is proven to extend run time on Porter Cable®, Saw Boss, and similar trim saws. 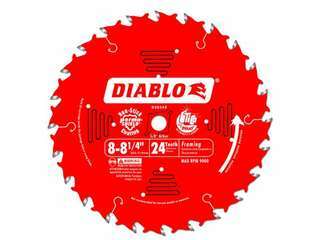 Diablo Finish blades are the perfect choice for excellent rips and crosscuts using a portable saw. They deliver a smoother edge than framing blades, but still provide an excellent combination of cutting speed and long life. A great choice for job-site finish cuts in 1X, decking, fencing, fascia and plywood. 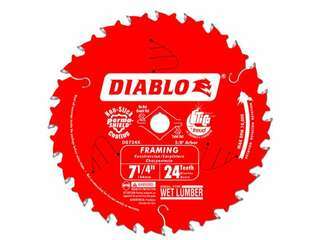 Diablo's Framing blade is ideal for general construction applications, including fast, efficient ripping and crosscutting. 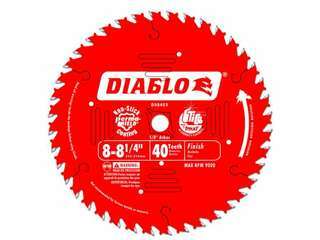 Diablo's blade cuts rough framing lumber, high quality finish lumber, plywood, OSB, and hardboard siding with the smoothest, fastest and most accurate cut. The thin kerf design requires less cutting power from the user and the saw for better control over the cut. 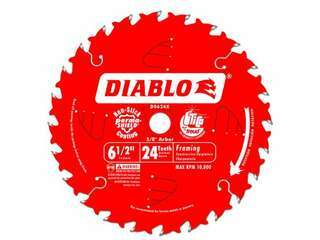 Diablo's ultimate framing/demolition saw blade is specially formulated to deliver superior cutting performance in the most extreme construction situations. 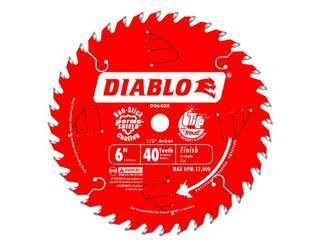 Diablo's Demo Demon is outperforming other standard blades up to 6X in intense applications. Demo Demon is able to withstand impact from embedded nails and other obstructions. 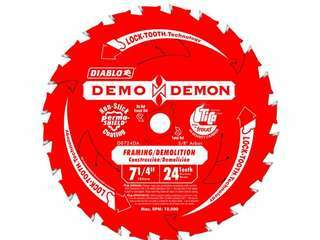 No matter what the job: demolishing a roof, removing exterior siding or sub floors, or framing new construction - make sure to choose Diablo's Demo Demon. Diablo's Finishing blade is ideal for smooth finish crosscuts in hardwood, softwood or plywood. A great choice for jobsite finish cuts in 1X, decking, fencing, fascia and plywood. Diablo's Ultra Finish Blades offer the quality that fine cabinetmakers expect with the capability to handle the extreme conditions of professional construction. 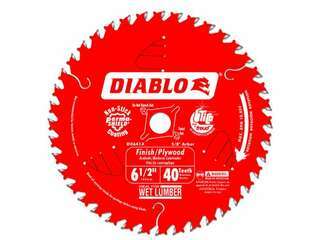 Diablo's blade produces a remarkably clean, chip-free cut that requires little to no sanding. 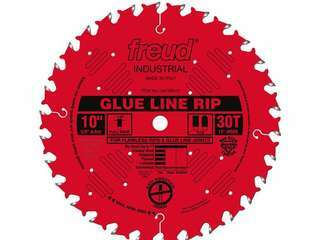 Ideal for crosscutting oak, pine, melamine, veneer plywood and delicate molding. 7-1/4-Inch by 6t , ATB, 5/8-Inch diamond twist out arbor. 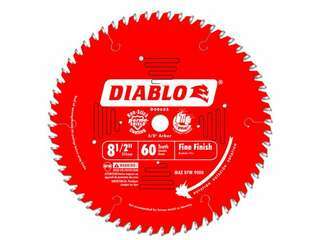 Diablo's Fine Finish blade is the ideal choice for trim carpenters because it leaves a smooth surface that requires little to no sanding. Ideal for crosscutting oak, pine, melamine, plywood, and moulding. 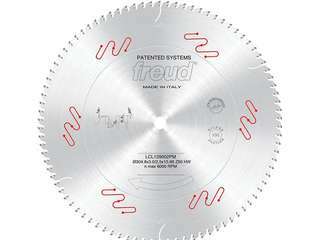 (Blades ending in "S" are also ideal for radial arm saws). 8-1/2" diameter x 6 tooth ATB with 5/8" arbor. Ultra Finish blades let trim crews get the most out of sliding or “chop” style miter saws, as well as jobsite or workshop table saws. The special cutting geometry and high tooth count produce extremely smooth cuts while minimizing “grabbing” or blowout. Flawless crosscuts in wood with minimal rework. Flawless finish in melamine & veneered plywood. Ideal For: Smooth, Fast Heavy-Duty Ripping. Depth of cut (3/4" to 2-3/4"). 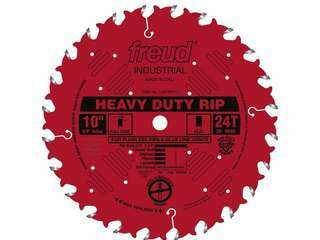 This blade gives smooth, fast rips in hardwoods and softwoods. 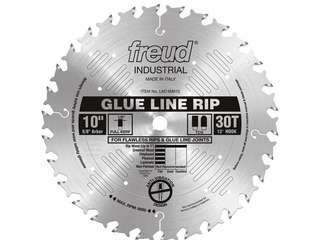 The combination of a rigid blade body and razor sharp flat top carbide teeth will provide a "glue line" precision cut. These blades are precision balanced and can be used in gang-rip operations. This blade also features laser cut anti-vibration slots, practically eliminating the vibration that resonates in standard blades. With this ultimate ripping blade, there is no need for stabilizers. 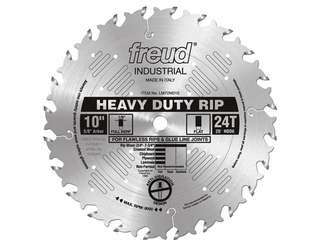 Ideal For: Heavy Duty Glue Line Ripping Blades For Superior Finish. Depth of cut (1/8" to 1"). This blade’s specially designed triple chip tooth design produces extremely smooth, true surfaces for gluing and finish work. There is no need for sanding or jointing after the cut. The ideal working range is from 1/8" to 1" thick. 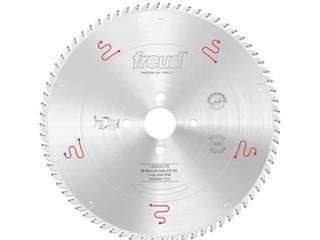 Ideal For: Thin Kerf Glue Line Ripping Blades For Superior Finish. Depth of cut (1/8" to 1"). 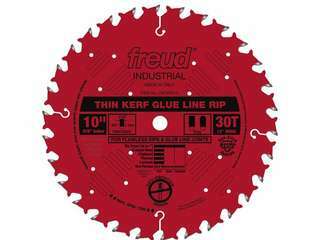 This thin kerf blade is specially designed triple chip tooth design produces extremely smooth, true surfaces for gluing and finish work. Freud’s continues to focus on innovation with the introduction of their new LSBX Extended Series that delivers 2X the life of Freud’s existing LSB product line. The new X-series ground-breaking design provides superior performance, extremely precise cuts, and virtually eliminates run out. Blades will enable manufacturers to increase efficiency, reduce down time, and lower tooling cost.